Two weeks from today, things are going to get a lot more serious. Because in fourteen days time I will go to the office I’ve worked in for the last decade and hand over my laptop, my blackberry and my corporate credit card… in short, everything that the respectable corporate clone could possibly need. I will be well and truly on my own. But far from being a calamity, this is a time to rejoice. Because this situation is entirely of my own choosing. That’s right. In this time of recession and rising unemployment, I have decided to leave my respectable, relatively secure job and start out on my own. Goodbye, regular pay check. Scrimping, saving self-employment, here I come. The idea of setting up my own business started a few years ago, when I found that I wasn’t as engaged with my job as I used to be. I worked hard, but found it more and more difficult to drum up the enthusiasm that used to accompany me on my way to work. And I found that, despite rising up through the ranks of the company, I had less and less freedom in what I did and how I did it. The company wasn’t going to change, so it was clear that I had to. So now I’m going to be my own boss. I’ll find the clients and I’ll do the work. I’ll make the decisions and I’ll pay the bills. I’ll fix the printer and I’ll make the tea. If I have an idea that I want to try out, then I can do it there and then. If a decision needs to be made, then I can make it without consulting with anyone else first. And if it all goes terribly wrong, then I’ll only have myself to blame. 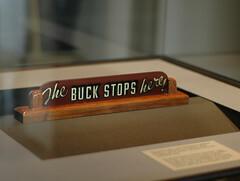 The buck truly does stop here. So here I am. Standing on the brink of possibly my most daring venture to date. Leaving the swish office and IT support for the kitchen table and a laptop. Trading the certainty of a salaried job for the excitement and anxiety of being my own boss. And with a massive grin on my face. This entry was posted in Life, Work and tagged Business, Change, Goals, Inspiration, Life, Thoughts, Work by Simon Perks. Bookmark the permalink. Thanks Harper – much appreciated. And you’re dead right, too. The really good things are rarely the easy ones. Simon.